But back to my original thought... It's alive!!!! I took a trip to Wal-Mart, and found out that the 1 year warranty on the battery expired on the 11th of this month. However, because I had taken the battery to have it looked at and attempted to recharge it, I had a sticker from the 23rd of last month to claim the battery died last month. So, the nice lady at Wal-Mart actually let me exchange it for money toward the purchase of a new battery. I was a little disappointed to find out that the original battery had a lower amperage than the astro was supposed to have, but the plus side is that it only cost me $30 to get a new battery. This one has a 3 year warranty. It had no trouble starting the car, and I found that to solve the problem of the power seat draining my battery, I can just pull the plug on the power seat. Everything seems in order to use the astro to move. I even thought about starting to move some things into the astro tonight (because I saw an awesome parking spot just across from my apartment in stead of the spot I've been claiming for the past 6 months down by the dumpster. I have to admit that it was convenient to have the astro there because I could unload all of the garbage from the car before I moved it over here. So, tomorrow I will go to work, swing out to Seattle after work to get James, then I think we will load up the van in tomorrow night, and finally move everything on Saturday! So, I am becoming more important by the day, and after I finish a few more automation scripts, I really think I will be able to seriously work on securing my place as a full time employee at Microsoft. Which I think is what I want. Worst case scenario it just looks really good on a resume. Speaking of sleep it is that time. Good night. Well, yesterday I finalized everything for me to move in next Saturday. I called James and made sure he can make it, I went over to the new apartment to make sure I can get in to the one I want, and make sure everything is in order for me to move in, then I came home an packed everything I own into containers. I broke down all the tables so they would be really easy to move, and I cleaned out my room of everything except my futon, a small dresser (containing all the clothes I need for the next week), and my tiny little computer desk. which comfortably fits my laptop on the keyboard tray. I have been constantly reminded of why I am so excited to move out of this apartment. The building is in the ghetto, it is just really inconvenient to take the bus, and last but not least (actually most importantly) I won't have to live with Evelyn any more. I have said to myself over and over that if she would spend half the time packing and moving her things as she has spent yelling at Mani, then she would be done and have her room cleaned by now. In stead, she has about half of her stuff in boxes, her room is a complete mess, and she will be begging me to help her next week. In the mean time, I have packaged everything in my room and the living room up, I have run the vacuum in my room, and the parts of the living room that she hasn't put her stuff in, I have cleaned all of my tables, and I am half way through with my dishes. I will let her clean her own dishes. By this time next week, I will be finishing up with the carpet cleaner, and getting ready to return it to Evelyn's mom. Then I will go to my new home, and enjoy my new apartment. I think I might even take next Monday off so that I can drop off the keys in the office... or at least come in late. Well, it's been a tiring weekend. especially yesterday. Yesterday I started the day by going up to Jet City for my morning coffee, and I also took Jaani for a walk along the trail. Then we took all three of the dogs up to Marymoore off-leash dog park. We walked all the dogs around for a while, then we took a walk down a nature trail, and I read a bunch of little plates that described the change we were going through from man made fields, to the succession zone, then to the marsh, and finally to the swamp, where the trail we walked on literally floated on top of the peat below the surface. When I finally got home, I went through all the stuff in my room, and packed everything away into boxes. I must say I sure am happy that I got those big Dell boxes from work. I only got six of them, but I used five, and then I let Evelyn have one (pretty much just to shut her up.) I swear, if she isn't complaining about Mani, she is telling me how much of an @$$ I am, or how much she hates Jaani. Part of me feels really sorry for her Babli. The poor dog. I am happy for Payal, but I fear hat she might be left with Ev once Mani picks up this permanent load down to Cali, where he will only be home on Thursday night. I wish I could afford all the dogs, I would just take them all with me. At the same time I will be happy to get away from Babli in the morning. As soon as Ev leaves, the little dog just starts barking really loudly, and when I told Ev that the neighbor above us was complaining about it, she just went on a rant about how he was making a lot of noise when he was setting up his bed the first night he moved in... he was pounding on the floor for like 10 minutes getting the thing put together so he could go to sleep. Well... I'm renaming the post to 5 days in counting! I was approved for my apartment in Renton. I am pretty sure I'm going to move in. It's the best move in deal, and I am pretty sure things will work out fine. My only concern now is just getting everything packed this weekend and ready for James to help me move next weekend. I have been working a bit lately. I have been averaging 10 hour days, and we have a deadline tomorrow for the pre-beta which we won't make, however we are will be ready for the internal beta launch. I finally understand what my test cases are, my machines are almost completely configured, and I am finally familiar with the team. I have 3 weekly meetings that I go to: Social team, Marketplace team, and All Test team. I really feel like the work I do is actually accomplishing a lot; I have had my hand in making sure several key features will be implemented by out RTW (Release To World) deadline at the end of April or Beginning of May. I like this position a lot. I get to actually code some automation scripts and have even submitted several scripts for the devs (Developers) to use to minimize the test cases I am adding to my own plate. My scope of influence on the project is much larger now then it was as a Test Associate. Not only do I organize test cases, but I also organize meetings, write test cases, co-ordinate between the two test teams I'm a member of, and I have direct interaction with the devs on a daily basis. If I can push the new features into the beta with a high enough pass/fail ratio, then I will definitely have a shot at getting hired as an FTE in August/September. I am the first one there every day, and the last one to leave; which I'm only happy about because that means I do enough to justify working the hours. (I suppose I only have crunch time to worry about.) My manager said that I might even get a team of minions to co-ordinate once we hit crunch time. I love it! Other than that... in the words of Dad: Work work work work work work work. Anyway... more later. sleep now. good night every body. So, after searching long and hard, I found a new apartment. It was unexpected when I found it. I went to Renton for a walk on Saturday, and as I was walking from Jet City to the trail, I noticed that one of the streets I always used to walk down when I lived in Renton; I noticed that the street looked a lot nicer than it used to. Where there once was old run down abandoned buildings on a dirty unmaintained streets, now stood brand new tall buildings, fresh grass next to the side walk, and families entering and leaving the buildings. On one side of the street is an assisted living home, and on the other side of the street was a brand new apartment building. 95 Burnett is written on the apartment building is large gold letters; the apartment office is open, and I go inside to have a look. I went up to look at four model apartments, and decided that I loved it! The best part, they allow dogs, and my total move in cost will be $155 (technically). They said that I will need to pay a $400 holding fee, which they will allow me to pay at the end of this week. They also said that by signing a 1 year lease, they will write me a check for one month rent, and 6 months of parking (it is extra for a parking space), plus, they will allow me to rent a tandem space for a couple months, but only include a single space on the lease. That is perfect for the Astro. Parking is in a garage under the building. The apartment is 720 sq. ft. The building has a party room, 24 hour fitness area, washer and dryer in the apartment, an outdoor community area with propane grills for residents to use, 1/2 block from the transit center, 1/2 block from the cedar river trail, and 2 blocks from Jet City. The end result, the two places I like to go the most are right by my apartment, and my morning commute is shorter if I take the bus than if I drive. After doing the math, moving to this apartment will save me $40 a month in coin laundry charges. With the estimated increase in gas prices with will probably save $250 a month in gas (assuming gas prices really do get up to $4/gallon.) Together both of these aspects outweigh the increase in rent that I will have. Plus, this apartment is in a much nicer area that this one. I will also have my social life back! Which I guess is mainly due to not having my current room mate, but that is a different story. So, I am excited to move. I am glad that the only apartment that I can really afford to move in to (as far as move in cost) is such a nice apartment that I can share with Jaani. Anyway... It's time for me to go to bed. I actually intended to start my next post immediately after finishing the first one... mainly because I wanted to finish talking about California while it was fresh in my mind... oops. So, just to finish the story... it is Saturday March 1st...I was on my way out to Point Rayes National Seashore to meet Liz and Uncle Bill, but it seems that I had made a wrong turn somewhere, and somehow found myself taking the 3 hour route to the park. I suppose it was kind of nice, because all the roads in that area lead between Pointe Rayes and 101. I just got off of 101 on the wrong road. oops... I guess I still got there. After a brief break at the visitor's center, I discovered that Jaani wouldn't be allowed on any of the trails, but there were some trails near that Jaani could go for a walk with me on; also there was a beach that they allowed dogs to run around on off the leash... so I sided with the beach, which was very long. I was happy to roam the beach for a while, and Jaani loved to run around in the sand. Unfortunately he was attacked by a bigger dog, and developed a slight infection in his eye, but it's getting better now that he is taking an anti-biotic. 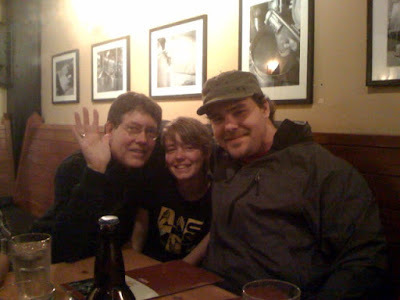 So, after a long time of searching for Liz and Bill, and eventually giving up, I was happy to meet them at the Pyramid brewery in Berkeley. I think in the end it was a good day, and we finished it off by driving out of town, and stopping on I-5 somewhere north of Sacramento (to avoid the possibility of traffic) . The next day we hit the road, and started heading home. I arrived home to discover Evelyn was completely devastated by the death of Pooky. She then went out to get a new dog. 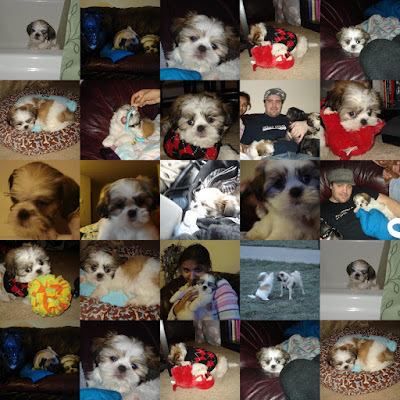 First, she got a black and white Shih Tzu code-named Bingo. I celebrated the new dog (who was old enough to have all of his shots) by taking him to Grand View park. I was really happy that I went that day because the cloud line was above the mountain. you can see Mt Rainier in full view behind us. Bingo loved the park, and Jaani was happy as usual to be there. After that, I took Bingo to the vet, and found out that he needed surgery to open up his nose. Apparently he could only breathe out through his nose, and had to breathe in through his mouth. So, after discovering that the surgery would cost $500, we would have to pay the money up front, and then be reimbursed by the pet store (after they were given money by the breeder); we decided to exchange the dog for a new one. I took the dog home, washed out his fur (because he was around my dog and a few other dogs at the dog park,) and then finally we took the dog back to the pet shop. In the end, we ended up with Babli (pronounced bubbly) who is a bit younger, but we are pretty happy with her. She was born on Christmas just like Pooky, she acts a lot like Pooky, is more playful that Bingo, and over all just seems to be a better fit for Evelyn anyway. It was a weird week, but I'm kinda happy about the whole thing... even though I know the whole thing has really bad timing for Evelyn... she can hardly afford to live... none the less actually support a puppy. I guess only time will tell. So, that's a little update... I have more pictures up on my online in my public photo gallery. So, that's it for now. I will be putting more pictures up fairly often, and I am making a few more albums that I plan to start sharing soon, so that is another site you might want to keep an eye on for a while. On Thursday I was informed that the funding for my project had been cut. I was laid off. Which meant that I had to find a new job fast! I had a funny feeling about the whole thing. I guess what happened is that during the 1 1/2 month hiring process, they spent way more money than the company had budgeted for that project. They started looking for people to fill the position in January (when I applied) and didn't hire anyone until last week. During that entire time, the project was spending money in an incomplete state. The whole thing was a mess from day one. I actually found it to be quite remarkable how much I was able to get done in one week, compared to what they had trouble doing in 2 months, and I was slowed down because I was learning how to do this stuff. So, the rest of their budget was spent on training me. To make everything just worse, Pooky died on Saturday morning. We haven't heard back from the vet exactly what happened, but it is just such a shame that such a cute little dog had to pass on so soon. I already miss Pooky, and Evelyn is still crying herself to sleep at night. All I can really do is try to comfort her a little, and help her deal with her pain. Apparently, she let Pooky out on Saturday night, and he went over behind the bushes to "do his business," when she heard him cry out a scream! she rushed to the door, and called him; he came running and screaming the whole way. She couldn't get him to stop crying, eat, or drink anything, and he just kept drooling. She called the vet, and the vet said it sounded like he was just scared by something, and he should be fine to bring in the next morning. The next day, while she was waiting for a ride to the vet, Pooky died in her arms. It has just been devastating for her. She felt like Pooky was completely hers, and nobody would be able to take her away, but then he passed on. I am sad to see the little guy go, and it is hard for me to keep my composure when she is so upset about the whole thing; I am trying to just be a good supportive person. Saturday, while Jaani and I were at the Beach in Point Reyes National Seashore, a bigger dog attacked him! I was so worried, and I had to fight the other dog off of him. He went after Jaani, and I grabbed his harness, but he had gotten Jaani by the back of the neck! I was so scared! I grabbed the dog's lower jaw, and squeezed right behind the dog's back teeth; this action actually forces the dog to bite it's own lip. The dog yelped shortly, and then let go of Jaani. Then I pulled hard on the dogs harness, and I must have thrown that dog a good five feet away from me. The other dog was fine, and today after taking Jaani for a check up at the vet, all of my fears were gone. I called the lady who had the dog, and I told her that my dog was OK; I also cautioned her that it is really hard to have to put a dog down, and if that happened to someone else, they might want to press charges. She felt horrible about the ordeal, and she sent me the cost of my vet bill to have Jaani checked out via pay pal today. She also told me that she was going to take her dog to some sort of aggressive animal training class that the state usually sends problem dogs to. I guess the point is to figure out what caused the aggression. So, everything is good, and I hope that if nothing else, this won't happen to anyone else. My pilgrimage to Mountain View California has been officially made for the first time! I was very happy to see the Google campus with my own eyes. I have more details about the evening down below, but the short story is that we got down there a little late, Matt and Jordan wanted to turn the entire trip into something about this whole cell phone business that Matt wants to get going, and I was a little disappointed that I didn't get to really code as much as I intended the entire time, but I'll get more into that after I tell about the best news yet... Here begins the story that starts on Thursday after I loose my job at Medtronic. So, when I was leaving Medtronic on Thursday after being laid off, which turned into my quitting shortly after, I got a call from Volt. Volt recruiters started calling me earlier in the week because I was eligible to work a complete year at Microsoft because I had finished my 100 day break. Plus, just for kicks, I completed a pre-screening questionnaire sent to me via email the night before. It turns out it was a recruiter looking to fill a build engineer position for Microsoft SQL Server. I really wasn't sure if I wanted to become a build engineer, however I decided I was in the area, and already dressed appropriately to go to an interview. So, I arranged for Volt to print a couple copies of my resume at the office on the Microsoft Campus, and I would also use that opportunity to park my car, and have a Microsoft Shuttle take me around campus. Right when I was ready to pick up my resume, I got a call from a different recruiter, who had another interview, and a phone screening set up; both of which were for Microsoft Zune. The interview was for a Software Test Engineer Level 2 for the Zune Social team, while the phone screening was the same position, but for the Zune Marketplace team. After completing my interview with SQL, I was sure that I got the job. I actually know I got the job, but I still wanted to see what other options I had open over at Zune. Especially seeing how all the positions payed the same, and I was already familiar with the Zune team (and I really loved it!) I took the shuttle over to the new Zune building, which I think is a little less flashy than the Bear Creek building was, actually it was a warehouse that is only half complete, but it was the same team. I got a call on my cell phone while I was enjoying the sun, sitting on a bench between buildings 86 and 87 on the Microsoft campus, it was my phone screening for the Zune marketplace. I recognized the voice immediately, and it was one of the people who helped co-ordinate my team at the bear creek building. I told him how building 87 does not hold a candle to the bear creek building, and he laughed, and asked if I had been there, I informed him that I was sitting outside; we decided we may as well meet face to face. We talked for about an hour about how the project was when I worked on it before, and I suggested things that I would like to change. He said that's exactly what they wanted, someone to come in and fix what was wrong with the product with new and innovative ideas. I felt right back at home. I knew that I was not going to take the SQL job, but at the same time I know that as an SQL build engineer at Microsoft, you can do what ever you want (career wise) after you work there for even a few months. Anyone can be a STE, but it really takes a unique skill set to be a build engineer. However, it is really hard to get in with the Zune team because everyone wants that job. Plus, it looks really good on my resume for me to work somewhere for a one month contract, then for them to hire me back for another contract. It shows that even though I left once, I did a good enough job for them to take me back. I now had to go to my second interview, which would set my opinion for sure. I walk out to the lobby to wait for my new manager to come out. A small Indian woman about half my size comes walking out. I greet her, and we proceed (back) into the office space. She said that she needed to find a conference room that was unoccupied, and I told her I was able to direct her to the room I was just in. She said that I seemed to know the building better than her already, and I laughed and said I just seem to have a way with directions. After talking for a while, I was able to analyse a coffee mug in ways nobody else had ever looked at a cup before. I thought of non-typical uses for the cup as a generic container, and ways to test the cup for durability and endurance to prove worthy of my strict coffee cup standards. We then started talking about what I actually knew about social networking sites, and what I knew about Zune Social. I told her that most of my Zune knowledge was focused on Marketplace, but we had to use Zune Social sometimes to find artist IDs in the database; I also told her about my experiences with Myspace, Facebook, LinkedIn, Launchpad, Orkut, Blogger, Plaxo, Live Journal, Photo bucket, mug, picasa... there are a lot of social networking sites, in fact they come a dime a dozen... Everything I talked about boiled down to one thing: Integrating Open Social to allow your social networking site to communicate with applications people have on other sites, and allow the user to maintain one profile that would be propagated to all sites (ei. Let this site just copy their facebook or myspace site). This makes it easier to market your product to someone who is already familiar with another social networking site. By the end of the day, I had 3 job offers. I chose the Zune Social team, because I have been obsessing over Open Social for months now, and if I can combine my new contacts from Google with my influence on Zune Social, then I can finally make a popular product I am truly proud to have my name on. Maybe I can't change the world, but I can bug the hell out of (as in write a lot of bug reports about) whatever I don't want to be realeased. Scrambling time!!!!!!! This is the point where I realize that the time I had already planned for packing to go to Mountain View, was spent in my interviews. It was about 4PM, and traffic was heavy. I needed to get to my apartment, then get out to Renton to get the guys. I thought hard on the way home about what I would need for my trip. I packed light, putting everything I needed in one backpack. I then packed all of Jaani's things in his little bag. Finally, I packed my computer stuff into another backpack. I grabbed a couple of cans of soup, a small sauce pan, snack bars, and five or six bottles of water on my way out the door. We hit the road at about 7PM Thursday night. We drove until about 1AM when we started to get into the mountains of Southern Oregon. We found a Motel 6, which seemed to be the best bet because they were cheap, gave a AAA discount, allow pets, and there are a lot of them. I was dead tired because I had woken up at 7AM that morning. The next day we got a later start than we expected, and we woke up at 9am. We planned to leave the hotel at 7AM, which meant we were running late. The construction zones, and the fact that it was the last day of the month seemed to slow us down because all the cops were out to fill ther quotas, and Oregon has a lot of "constructions zones" even though there is never any equipment or people working in said zones. We got down to Moutain View at about 5PM on Friday, which meant we had completely missed the 2PM session, but we were early for the 6PM session. We talked to the people, and I talked to Jordan about programming, even though I really wanted to be making a program rather than explain to him how to do stuff. I found that I was able to talk to every Google employee there, and have questions for them to answer. I talked to someone about: Android, Gears, Search API, AJAX, Maps, GMail, Blogger API, Reader, Adsense, Adwords, Notebook, Page Creator, Webmaster Tools, Base, Checkout, Custom Search, Labs, and Products. I must have talked to at least 20 people at Google, and seven or eight people who worked in the area for Google's ecosystem of corporations. It was an inspiring event for me. When all was said and done, I got a bar of caffeinated soap because I drove all the way down there, and asked so many questions that just made the Googlers think about how people learn and interpret there projects. We then got a tour around the campus, but they didn't let us bring a camera, so I have a picture of this sculpture on the campus. The Googleplex is such a welcoming environment. I would move down to Mountain View in a heart beat for the opportunity to work in those buildings. Just looking around at the architecture you can hardly even find a right angle, a wall without a curve in it, or if there is no curve, lines that are parallel to anything around them. Just the buildings alone make you think outside the box. That is if the employee built and maintained Zen, vegetable, or flower gardens don't help you think. Maybe the 20% free time on the job to pursue any project you think Google needs; perhaps you are inspired by the sports park or mazes. Perhaps if you are tired all you need is an hour or two of sleep in one of the dorms; Heck, you can even bring your laundry to work and have the housecleaning staff take care of your laundry while you are at work. Yes, I will work here one day. I do like to put a huge emphasis on how great the Googleplex is, however, Saturday was also an exciting day.